Kuwait, April 16, 2018: Tamdeen Group opened Al Kout Mall to the public at 10:00 am, Monday April 16, 2018 as the latest addition to the Al Kout project, Kuwait’s Largest Waterfront Retail and Leisure Destination. Al Kout Mall is the latest dynamic development from Kuwait’s leading property developer, and the ultimate destination for shoppers, tourists and thrill-seekers from Kuwait and the region. In celebration of the opening, the Mall has organized a rich month-long program of events, including international acrobatic shows from the UK, and an indoor hot air balloon experience for children for the first time in Kuwait. Al Kout Mall is the latest addition to the large-scale Al Kout project and is interconnected to the rest of the six experiences. While there is a direct connection to the Al Kout Rotana hotel from the mall, a beautiful pedestrian bridge on the Mezzanine level connects to the modern Arabic-style Souq Al Kout with its iconic musical fountains. From Souq Al Kout, visitors can enjoy a seamless journey through the rest of the diverse experiences including Nag’at Al Kout, Marsa Al Kout, and Sahel Al Kout. Mr. Muath B. Al Roumi, General Manager, Tamdeen Group Marketing, said: “Al Kout Mall, the largest shopping and entertainment destination in the South of Kuwait, features contemporary and distinctive architectural designs to serve the southern regions, the entire population of Kuwait and visitors from abroad. The mall will provide an enriching family experience, full of fun and entertainment in one location”. Al Roumi added: 'Tamdeen Group is constantly developing strategic investment projects that reflect the strength of the country’s commercial sector and support the thriving tourism sector. Therefore, we are confident that the Al Kout Mall, along with all six experiences in the Al Kout Project, will provide a truly great experience for visitors to Fahaheel”. With the addition of Al Kout Mall, the Al Kout Project now offers a total of 100,000 square meters of retail opportunities, across 360 retail outlets. Al Kout Mall’s retail offering, spread over three floors, features an extensive range of fashion outlets for women, men and children, including some of the world's most popular brands and anchor stores such as H&M, Zara, Marks & Spencer, West Elm, Victoria’s Secret and GAP. The mall is also home to number of leading cosmetics brands, such as Sephora, Makeup Forever, Vavavoom, MAC and the all-new to Kuwait Urban Decay, NYX and KIKO Milano. Al Kout Mall features luxury home furnishing and interiors brands, including West Elm, Zara Home and H&M Home, catering to all customer needs. More than 10 new exciting brands are making their debut in Kuwait, including Fol O’Yasmine, Geekay Games, House of Samsonite, Bianca, Black Tap, New Balance, Levi’s and more. Al Kout Mall offers dedicated dining areas featuring an eclectic blend of international restaurant chains and regional cafes, plus nine local Kuwaiti brands including Poele Caf�, Life with Cacao, Karak Gholam, and Triangle, amongst others. Meanwhile, the mall’s food court comprises popular fast food restaurants to ensure an exceptional dining experience. 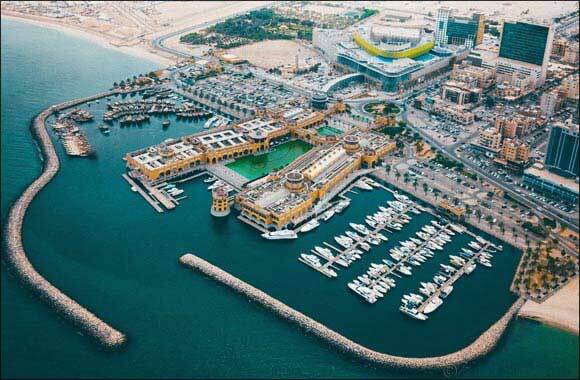 Visitors can also enjoy scenic outdoor seating on the restaurants’ terrace that is set to open shortly, and boasts panoramic views over the distinctive Al Kout coastline. As part of it’s appeal as a family entertainment hub, Al Kout Mall is home to Infunity Sea; the latest addition to the world of family entertainment. Inspired by Al Kout’s marine theme, Infunity Sea will open during the second quarter of 2018. The state-of-the-art Cinescape, which offers the latest movie viewing experience with high-end design standards, will also open during the third quarter of 2018. Another unique feature coming to the Mall in 2019 is Kuwait Karting. Located on the roof of the mall, Kuwait Karting is the biggest indoor go-karting track of its kind in the Middle East. In line with its customer-first approach, Al Kout Mall hosts 14 specialized complimentary customer services for visitors ranging from gift wrapping, high-speed free WiFi, mobile phone charging units, wheelchairs and mobility scooters for the elderly and more. With the convenience and comfort of visitors in mind, Al Kout project and Al Kout Mall offers a multi-level car park and external parking with a capacity of holding approximately 3,600 cars. The mall has three entrances on the ground level, making it easy to walk into the mall, as well as several entrances from the multi level car pack with conveniently placed elevators and escalators, for easy access to mall. In addition, Valet Parking is offered at Entrance 1 on Dabbous Street.